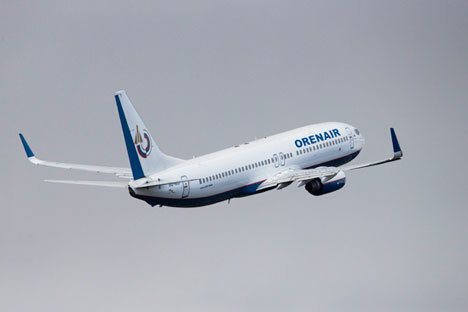 A Boeing 737 jetliner belonging to Orenburg airlines takes off at Vnukovo airport outside Moscow, Russia, Tuesday, April 21, 2015. One of the most popular civilian aircraft, the Boeing 737, which accounts for 20 percent of the country’s airline fleet, has been subjected to a formal suspension by Russia’s aviation committee over technical concerns – but the government has rejected the ban. Media see the ban as possible revenge on the state by a former owner of the bankrupt Transaero airline, who now heads the aviation committee. Russia’s establishment has been divided by a disagreement over a ban imposed on Boeing 737 aircraft in the country, with the government dismissing a decision by the Moscow-based Interstate Aviation Committee (MAK) on Nov. 5 to suspend the flight certificates of all Boeing 737 models over safety concerns. The MAK suspension applies to all Boeing 737 aircraft, including both the Classic and Next Generation modifications. The committee’s press service told RBTH that the ban was caused by technical problems with the aircraft which resulted in a crash at Kazan airport in 2013. Under Russian law, first MAK issues special certificates to allow the operation of specific aircraft and then the Federal Air Transport Agency (Rosaviatsiya), part of the Russian government, issues the airlines with the relevant permissions. However, the government has rejected the MAK ruling, with the Rosaviatsiya press service saying that MAK was not authorized to ground aircraft. Furthermore, only six Boeing 737 aircraft are registered in Russia and therefore fall under Russian jurisdiction, while the rest of the aircraft are registered abroad. Overall, there are some 200 Boeing 737 aircraft operating in Russia, making up 20 percent of the country’s air fleet. The problem is that MAK is in no way subordinated to the Russian government. The organization deals with aircraft certification and investigation of air crashes and other incidents. The MAK leadership is appointed by the heads of 11 states forming part of the Commonwealth of Independent States, which unites the majority of former Soviet Union republics. In that association, Russian President Vladimir Putin, just like the other CIS heads of states, has only one vote. In November 2013, a Boeing 737-500 belonging to Tatarstan Airlines crashed during landing at Kazan airport, killing all 50 people on board, including the son of the president of Tatarstan, one of Russia’s major regions. The MAK investigation concluded that the incident was caused by a fault with the aircraft’s elevator control system and these findings have been presented to the U.S. Federal Aviation Administration’s representative in Russia and the CIS, Andrew S. McKee. In the end, MAK asked Rosaviatsiya and FAA to demand that the Boeing corporation make the necessary improvements to the 737 model. However, according to MAK, Rosaviatsiya, despite being fully aware of the existing faults with this model, failed to inform airlines or the relevant supervisory bodies. As a result, MAK maintains, passengers were subjected to serious risk. However, according to Russian media, the Boeing 737 ban may have other reasons behind it. Since its establishment in 1991, MAK has been headed by Tatyana Adonina, who used to be co-owner of Transaero, Russia’s second-biggest airline, which in October 2015 had to cease operations after accumulating debts of 250 billion ($3.9 billion) and failing to secure government support. Furthermore, Transaero majority shareholder Alexander Pleshakov happens to be Adonina’s son. The influential business daily Vedomosti, citing a source in the Russian government, suggested that the Boeing 737 ban may be Transaero owners’ revenge for closing the company down. After MAK issued its decision to suspend Boeing 737 certificates, the Russian government held a special session on Nov. 6, at which key airlines refused to abide by the ban. After the government session, Natalya Fileva, a co-owner of Russia’s third largest airline, S7, announced that MAK had withdrawn its decision. For his part, Boeing president for Russia and the CIS Sergei Kravchenko said the company was satisfied with the meeting at Rosaviatsiya: “The Boeing 737 is one of the safest aircraft in the history of civil aviation,” he told the TASS news agency. However, two days later, on Nov. 8, MAK issued a new statement, denying that it had revised its decision. It also pointed out that MAK head Adonina was not even present at the government meeting. According to Igor Kovalyov, an InstaForex analyst, the MAK ruling will first and foremost affect Russia’s biggest airline Aeroflot, since the entire fleet of the company’s low-cost arm, Pobeda, is made up of Boeing 737s. Read more: Who will profit from flights from Russia to Ukraine now?